I’m rapidly becoming a huge fan of tempeh. I think I might like it better than tofu when it comes to soy products. It has a lot more texture and is honestly a lot easier to cook. When meat eaters ask me what vegetarian options taste most like meat, the answer is tempeh. It’s just very hearty and flavorful. Plus you can grill it! This salad took me just a few minutes to toss together and it fed me and Betsy for a few days. It’s very healthy and perfect for the summer! 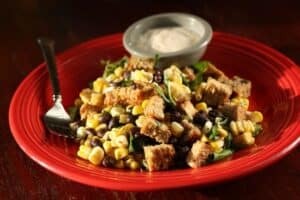 Tempeh grilled with fresh corn and mixed with other tasty ingredients for a delicious, healthy salad. 1) For sauce, mince garlic and dill and stir with other ingredients. Let chill until needed. 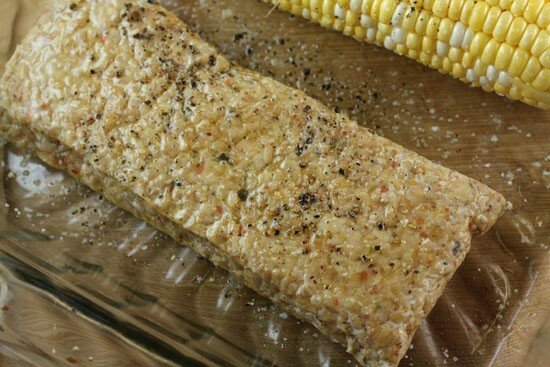 2) Rub corn and tempeh with a bit of olive oil and season with salt and pepper. 3) Grill corn over medium-high heat for about 12 minutes until there are light grill marks on each side. 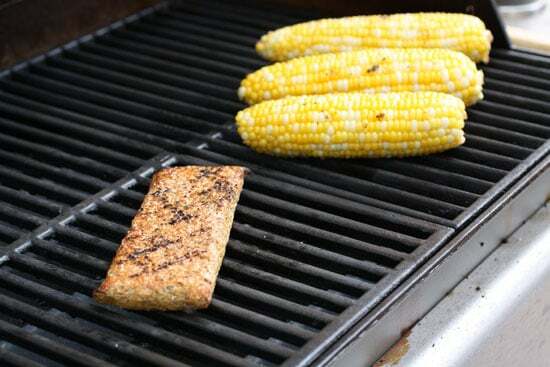 4) Grill tempeh over medium-high heat for about 8 minutes until it has a crispy exterior. 5) Cut corn off the cob and cube tempeh. Mix with rinsed black beans and minced basil. Stir in a bit of olive oil and season with salt and pepper. Serve warm or cold! 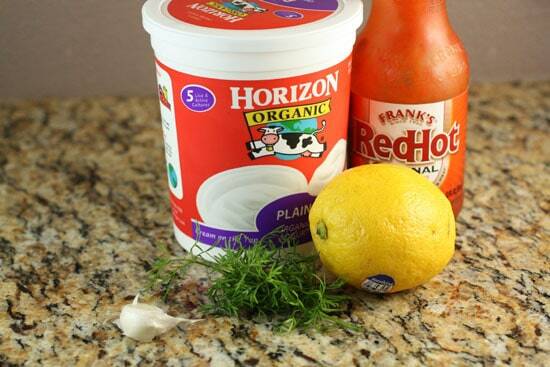 I’m not even sure that you entirely need a sauce for this salad. 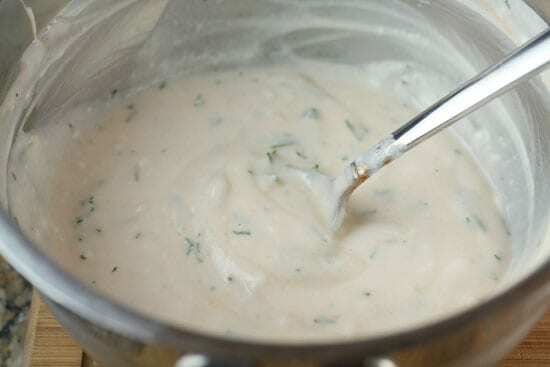 It’s pretty good without it, but I decided to whip one up just to try it and I really liked it with the sauce. So you can take it or leave it. If you take it though, you’ll need these things. See that dill? From my garden. No big deal. I just grew it from THE EARTH. Anyway, dice up the garlic and dill really finely and stir everything together. Add as much hot sauce as you want really, but start with a tiny amount. Mine kind of took on a light pink hue. It’s not really necessary to grill the things in this recipe, but I like the slightly charred flavor. If you don’t have access to a grill, you could roast the corn for a few minutes and sear the tempeh in a hot pan. 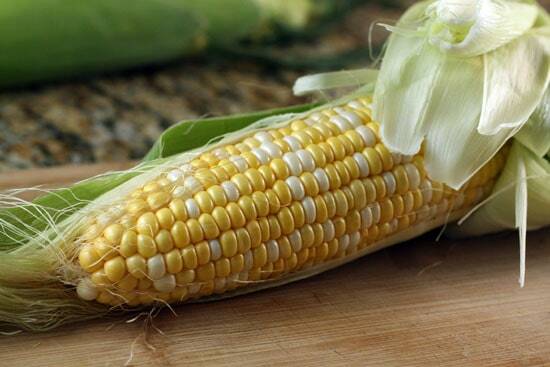 This time of year, use fresh corn if you can find it! Rub the corn and tempeh with a light coat of olive oil and season them with salt and pepper. I used a garden veggie tempeh, but use whatever flavor you want! 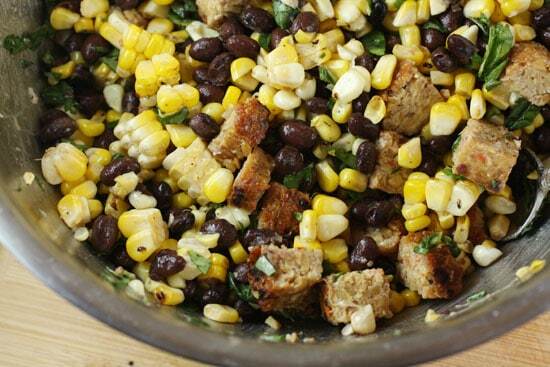 Heat your grill up to medium-high and toss on your corn and tempeh. I’d recommend starting the corn about 5 minutes before the tempeh. The tempeh will need maybe 4 minutes per side. It’s already cooked so you really just want to crisp up the outside a bit and give it some nice char. Turn the corn every few minutes and you should be getting a few light grill marks on them. My grill almost revolted RE: tempeh. 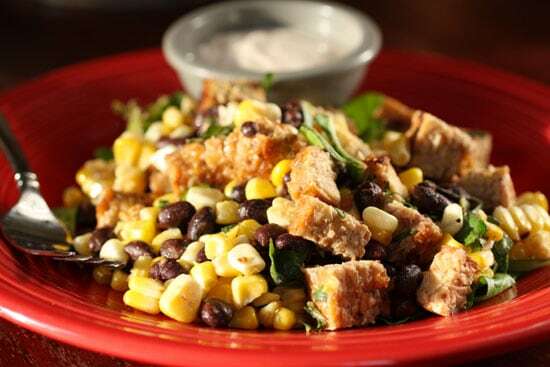 When everything is done on the grill, cut the kernels off the cob and mix it with some black beans. I used canned beans that I drained and rinsed really well. Cube up the tempeh and mince a jalapeno and some basil. The jalapeno is optional, but I like the heat. Then just stir everything together and drizzle in a tiny amount of olive oil. Season with salt and pepper and you’re all set! This is great as-is, but like I said, I think it’s fun to serve a bowl of the sauce on the side. This was one of those meals that’s not only filling and tasty, but leaves you feeling very healthy when you finish it. It works great as a side, as a main dish, or as a lunch. I’m telling you, as a pretty solid carnivore, I can’t get enough tempeh these days. My goodness, but you do whet my appetite! Just so happens I'm on a 30 day respite from all things beef. Nobody said I couldn't have everything else! Is tempeh as easy to find as tofu? Yep! It's becoming very popular. You should easily be able to find it at most natural food stores. Even my city market carries it these days. It needs to be refrigerated, but stores keep it in different areas… might have to ask for it. I only recently discovered tempeh myself, and it's completely turned my summer around — and summer's barely started yet! Since I've started seeing a sports nutritionist and having to make (seemingly huge, but actually not really) changes to my diet, finding protein sources has been a real headache. But tempeh is so versatile, and it cooks up so quickly and well; it's really made life a lot easier lately (and a heckuva lot tastier, too). Do you have a favorite brand? I favor a local company called SoyBoy: They make a low-fat five-grain version that's really nutty and delicious.